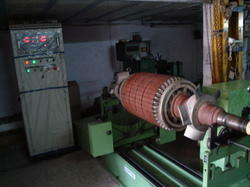 We undertake Dynamic Balancing of Rotary M/cs on various capacity Schenck Dynamic balancing machines. 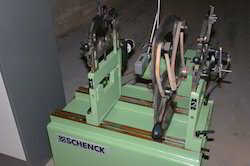 Our Balancing capacity is from 0.5 Kgs to 30 Tons on following Schenck Balancing machines installed at our Balancing Division Rabale Navi Mumbai. 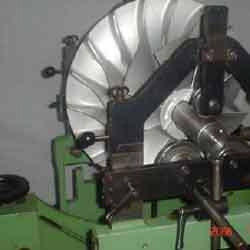 The small capacity Balancing Machine weight 0.5 Kg to 300 Kgs are suitable for small Fan blades, Armatures, Rotors, Turbochargers, Spindles, Motor cooling Fans, Gear Shafts, Armature, Pulleys, Brake Drums, Small rigid & flexible Rotors etc,. weighing up to 300 Kgs. 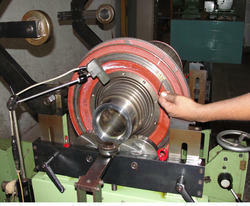 For getting better result of balancing, we select small capacity balancing machines for this types of jobs. 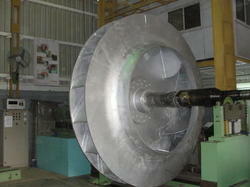 We are well versed enterprise providing professional Impeller Balancing services. 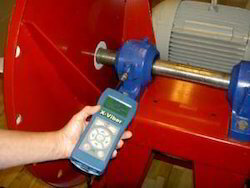 Our offered services are rendered by trained engineers and executed with compliance to the industrial standards. Our workforce is trained to provide diligent services that improve the efficiency and service life of various industrial fans. Moreover, we are providing these hi-tech services at the best price in the industry. The image shows typical job having 10 Tons being attended by us for Thermal Power Station through their vendors M/s. Vautied Shah Navi Mumbai. 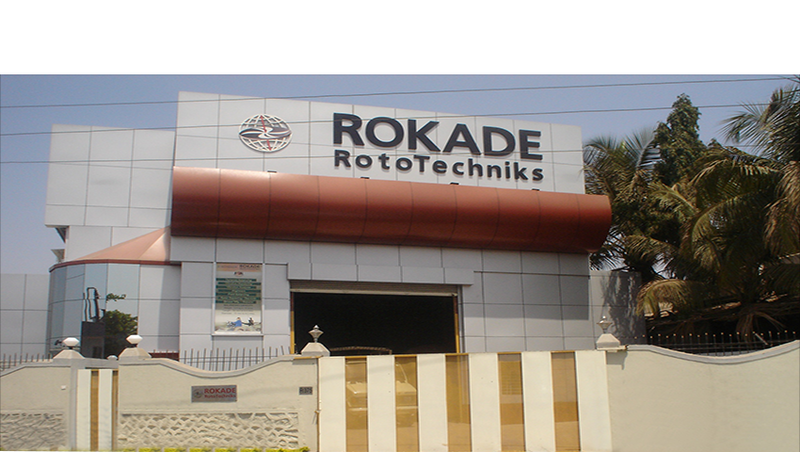 We are well versed enterprise providing professional Dynamic Balancing Of Impeller services. Our offered services are rendered by trained engineers and executed with compliance to the industrial standards. Our workforce is trained to provide diligent services that improve the efficiency and service life of various industrial fans. Moreover, we are providing these hi-tech services at the best price in the industry. The photo shows typical job weight having 14 Tons being attended by us for L & T through their vendors. 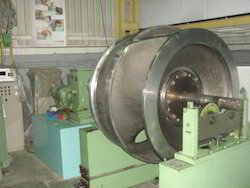 We are well versed enterprise providing professional Impeller Balancing Services services. 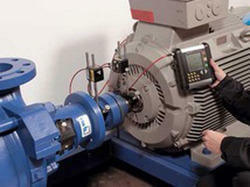 Our offered services are rendered by trained engineers and executed with compliance to the industrial standards. 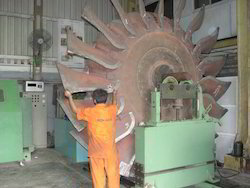 Our workforce is trained to provide diligent services that improve the efficiency and service life of various industrial fans. Moreover, we are providing these hi-tech services at the best price in the industry. 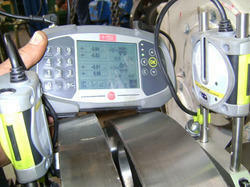 This photo shows typical job being attended by us for motor manufacturers. 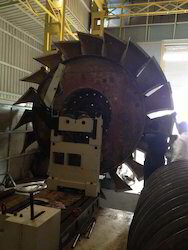 Our vast technical excellence has enabled us to provide highly advanced Fan Balancing Services. We are capable to handle large recurring balancing projects with acute professionalism. 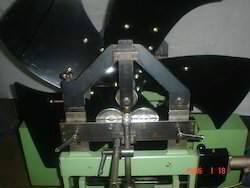 Besides, our adeptness to operate horizontal and vertical balancers has made us the preferred choice for a large number of clients looking for tight balancing services. 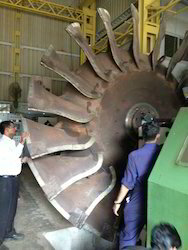 The photo shows typical fan of weight having 6.5 Tons being attended by us for M/s. Uttam Value Steel Ltd Wardha M.S. 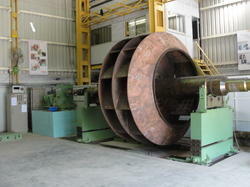 We have balanced this job on our SCHENCK Balancing M/c Model H 70U/BU (End / Belt Drive) having M/c capacity upto 30 Tons. 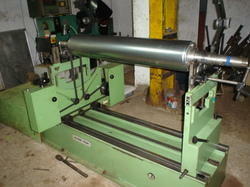 These Machines are suitable for Balancing of all bigger Rotros of Heavy Machines Re-builders / Re-winders. 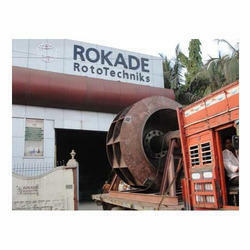 These machines are suitable for balancing of the above rotors at 200 / 400 RPM, as per job weight specification, and balancing of all bigger Rotors, ID / FD Fans Fibrisors of Sugar Plants, large blower impellers of Cement plants, Power Plants, etc. 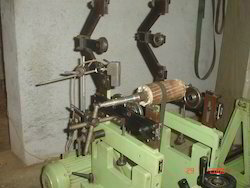 These Machines are suitable for Balancing of the above Rotors at 200 / 400 RPM, as per job weight specification. 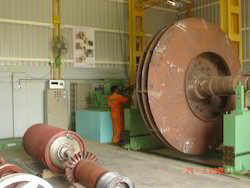 This image shows typical job weight having 12.5 Tons being attended by us for RIETZ Hyderabad. 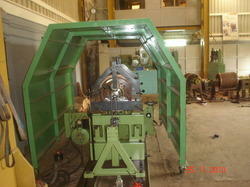 These Machines are suitable for Balancing of all bigger Rotros of Heavy Machines Re-builders / Re- winders. 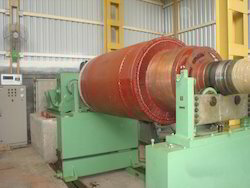 These machines are suitable for balancing of the above rotors at 200 / 400 RPM, as per job weight specification, and balancing of all bigger Rotors, ID / FD Fans Fibrisors of Sugar Plants, large blower impellers of Cement plants, Power Plants, etc. 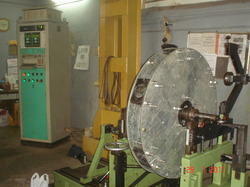 These Machines are suitable for Balancing of the above Rotors at 200 / 400 RPM, as per job weight specification. This image shows typical job weight having 12.5 Tons being attended by us for L & T.
Installed machines suitable for Jobs - Capacity from 10 Kg to 5500 Kgs, Belt drive, SCHENCK. 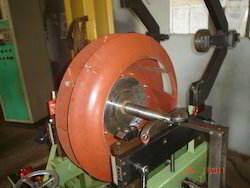 Belt drives are used for balancing of Rotors where high accuracy is desired and errors due to the driver unit cannot be tolerated and which eliminates the need of adapters. 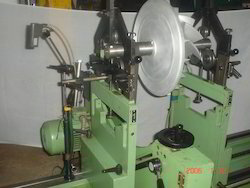 However, it is ideally suited for cylindrical rotors where it is easy to run the belt as in case of armatures/ Printing rolls etc,. This machine is suitable for job length up to 6.5 mtrs, job like Agitator shafts, Turbular coupling shafts for cooling towers, fan hubs, effluent plant drive shafts, erector drive shafts, etc,. 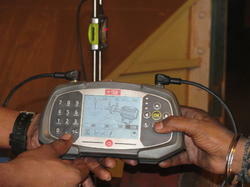 The image shows typical job of weight having 850 Kgs being attended by us for M/s. Gammon Cooling Towers Limited Vasai. Virtually all types of rotrs can be balanced on these models. Easy access for loading and correction. Overhead EOT Cranes for loading / unloading the jobs. 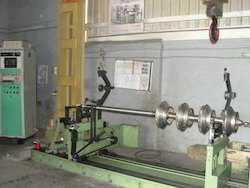 The small capacity Balancing Machine weight 0.5 Kg to 300 Kgs are suitable for small Armatures, Rotors, Turbochargers, Spindles, Motor cooling Fans, Gear Shafts, Armature, Pulleys, Brake Drums, Small rigid & flexible Rotors etc,. weighing up to 300 Kgs. 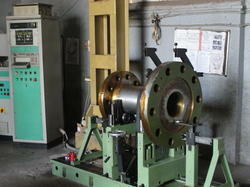 For getting better result of balancng, we select small capacity balancing machines for this types of jobs. 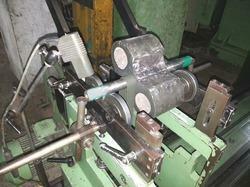 The photo shows job on MAN TURBO Turbo charger Rotor through their vendors, being balanced at speed of 2800 RPM.